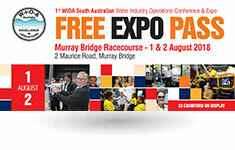 The WIOA South Australian Water Operations Conference and Expo is coming to the Murray Bridge on 1 & 2 August 2018. The expo provides a chance to discover and research new technology, equipment, services and ideas. See the very latest in treatment and distribution, wastewater collection and treatment, water supply, reclaimed water or biosolids, project management, asset management, development and application of new technologies, training and safety issues from some of the world’s leading companies. If you’re an operator, manager, engineer, consultant or professional or someone who is working in the water industry or just has an interest in water, then this is a must attend event. Entry to the trade exhibition only, is FREE which allows allied industry personnel such as plumbers, trade waste, mining, food and beverage employees and contractors access to the exhibition. The winner will be announced at 3.00pm and will have bragging rights as having the Best Tasting Water in South Australia.